The Reading Cove Book Club ❧: ★ Book Review ★ Sacred America, Sacred World by Stephen Dinan! 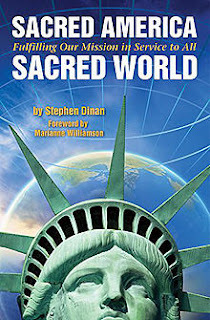 ★ Book Review ★ Sacred America, Sacred World by Stephen Dinan! Infused with visionary power, Sacred America, Sacred World is a manifesto for our country’s evolution that is both political and deeply spiritual. It offers profound hope that America can grow beyond our current challenges and manifest our noblest destiny, which the book shows is rooted in sacred principles that transcend left or right political views. Filled with practical ideas and innovative strategies honed from the author’s work with over 1000 luminaries via his company, The Shift Network, Sacred America, Sacred World rings with a can-do entrepreneurial spirit and explains how America can lead the world toward peace, sustainability, health, and prosperity. This vision of the future weaves the best of today’s emergent spirituality with seasoned political wisdom, demonstrating ways America can grow beyond its current stagnation and political gridlock to become a world leader in peace and progress. Published to coincide with the party conventions and presidential debates, this book will promote a return to the sacred principles cherished by America's forefathers in order to create a “transpartisan,” non-ideological, pragmatic approach to social reform. This uplifting discussion explores evolutions in political leadership, environmental concerns, and economic reformation. It is time to forge a bold new image of America’s future. Here is a road map for getting there. This book is a very powerful and unique read. Based on how if we as individuals open our minds and become a more spiritual nation, we could save America and maybe even the world. Dinan speaks of the many accomplishments of America as a whole, from our very beginnings of separating our nation from Great Britain, to the equality of African Americans and women from the 1960s until present day. He speaks about becoming a better nation by being more of an American family as a whole instead of just being individuals chasing those materialistic dreams we may have. It is a much needed and enlightening book in a time where our political world is in such shambles. He calls this new ideal an American Evolution as opposed to the American Revolution. Pointing the way to becoming a great nation again and hopefully changing the world as well. This book is a must read for anyone who is upset about America's political turmoil. It's very thought provoking and it personally made me feel a little better about how the world may co-exist in a more peaceful way. I myself do not watch a lot of news, political or otherwise; however, I do keep an eye on what is going on in the world and America. I just chose not to be overloaded with it all. His thoughts range from economy to being a greener world and being a leader in this evolution; and, to me, possibly a new and shiny star in the world. I really enjoyed reading this book and I hope others will look for it as well. Stephen Dinan is the CEO of The Shift Network and a member of the prestigious Transformational Leadership Council and the Evolutionary Leaders group.